The woman peered down at me along a long, beak-like nose. Yes, I do know. But I also know that there is going to be a strong north easterly wind. I am not missing out on the opportunity of being blown by 35km per hour gusting winds all the way to the mainland. Last night I actually dreamt about tent drying. The dreams were so exciting that they woke me up several times. THAT is how exciting my life is. Thanks to good luck and ingenuity (of hanging the tent under a porch) I managed to pack up a dry tent. I faffed enjoyably for over an hour in the campsite common room, enjoying the free coffee and wifi while delaying the moment I’d have to hit the road. Eventually I got a tweet from David asking me if i was on the road yet. 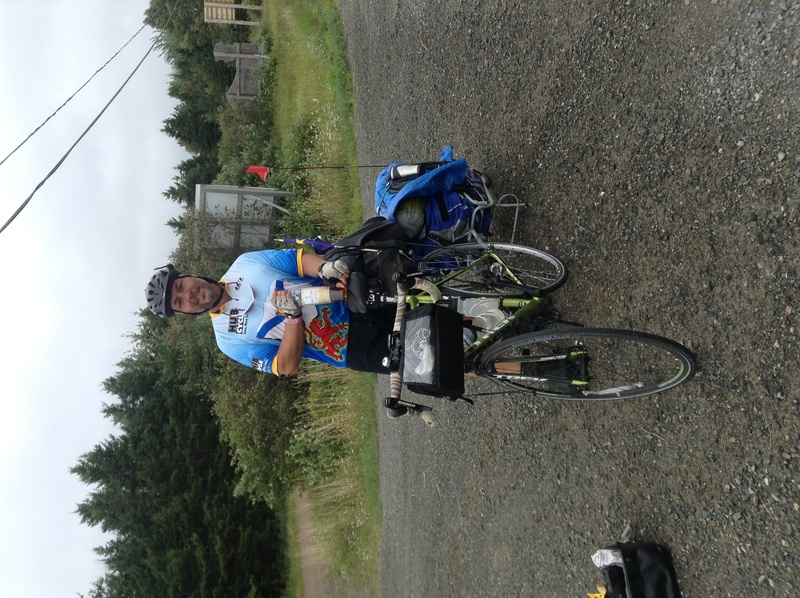 David is another trans-Canada cyclist who I know from Twitter. 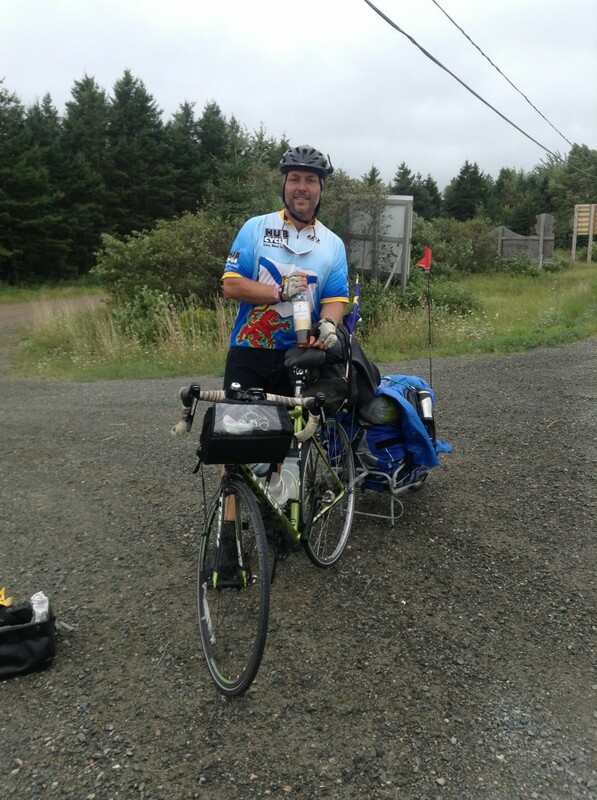 Following each others’ blogs, we worked out that today we would pass each other as I head west to the mainland and he heads east to Newfoundland. Only a few kilometres down the road I spotted the outline of a man on a bike with a trailer and I crossed over to meet him. I’d never met David before this roadside encounter but it felt like bumping into an old friend as we shared a swig of scotch, a handful of M&Ms and our stories of the road. David said he felt like we were about to graduate. We are “the class of 2013″. This journey across Canada has been mixed with so many other people’s journeys: David’s, the Wanderers’, Nicholas’, Kat’s. I will remember these people as though they were school mates I grew up with. Being this close to the finish, David and I discussed what it would feel like to be back at work. Then a shadow appeared in the sky. The bald eagle swooped down and tilted in flight, revealing the width of its magnificent wings. Our conservation faltered as we stopped and stared. The eagle curved in the sky over the far lake before disappearing. David hydrating for the road ahead. I cycled off in high spirits, thinking of what David had said and savouring the time on the road. The wind was strong as it pushed me up the highway hills. The rain started soon enough. The sky was a blank, cold grey. But I cycled along with a grin on my face. My happiness grew when I discovered a large slab of Nanaimo bar for sale. Upon first chomp I declared it less tasty than my mother’s but I still managed to polish off a good third of the slab within 1 meter from the store’s exit. The rest didn’t last much longer. Throughout the afternoon I cycled through a grey, fine rain. Monty’s tyres made the familiar slink noise as they splashed along the wet highway. The monochrome vista of Bras d’Or lake disappeared as I climbed over the inland hills back to the Causo causeway that I crossed a few days back. Since it was raining I cheekily asked if I could eat inside the tourist info. As a bonus from being dry and warm, the tourist info also offered me free wifi and a big leather sofa still warm from the previous occupants’ bottoms. Best lunch location of the whole trip. Over the causeway the land was obscured by drizzle. During the last few miles it seemed to get colder and wetter. Until by the campground I was bordering on that line which, under circumstances when I am not outlandishly happy, would have pushed me into a Grump. I wanted to eat dinner but it was raining outside and I dare not cook in my tent porch for fear of flames, death etc. Looking for the only cover I could find I squeezed myself under a picnic bench. You might think “my, that must have been a big picnic bench.” It was not. I am, on occasions such as this, grateful for being so short. Kraft dinner consumed, I broke a light stick for cheer and fell asleep to the sound of the rain drumming on my tent flaps. Doubtless to be consumed by more dreams of tent drying.